Happy Thursday... It's almost Friday. 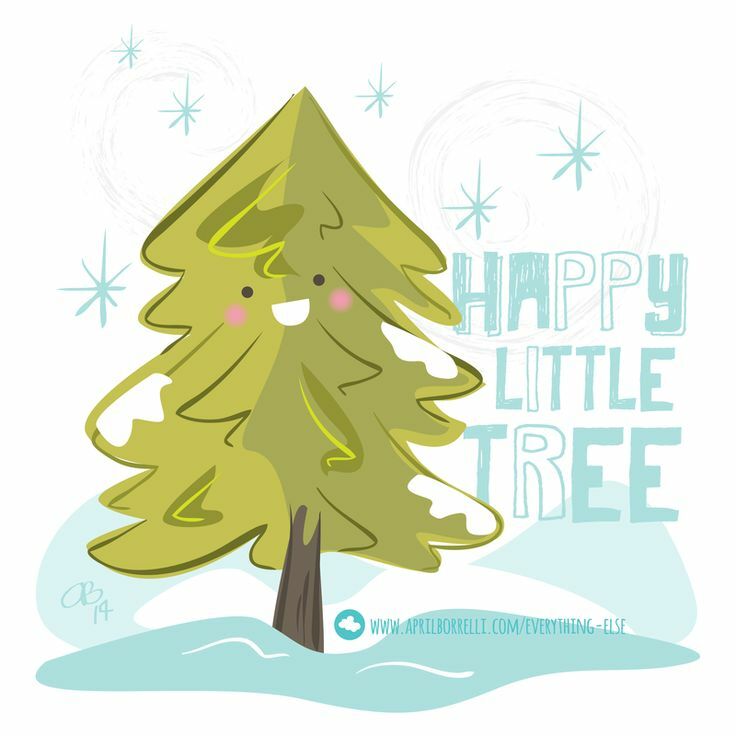 Here's a Happy Little Tree. 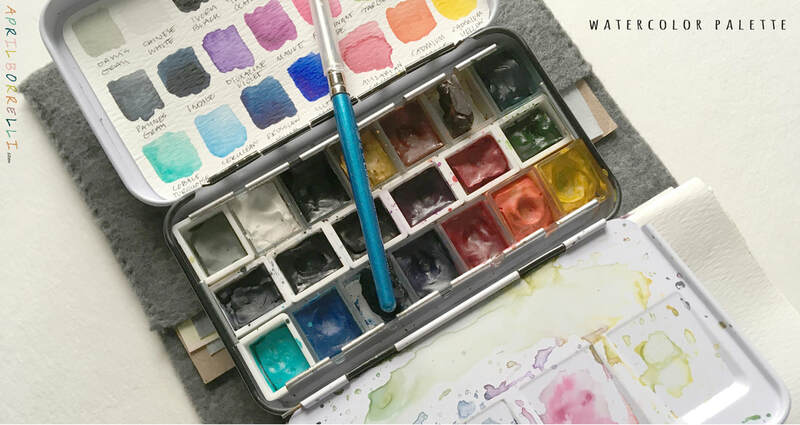 Watercolors are one of my favorite art mediums and I am a little obsessed right now making the perfect watercolor/ art travel kit. I have several different variations at the moment. Finding the in between of having too much junk in your bag and not enough can be tricky. I am notorious for bringing too much stuff with me everywhere I go. 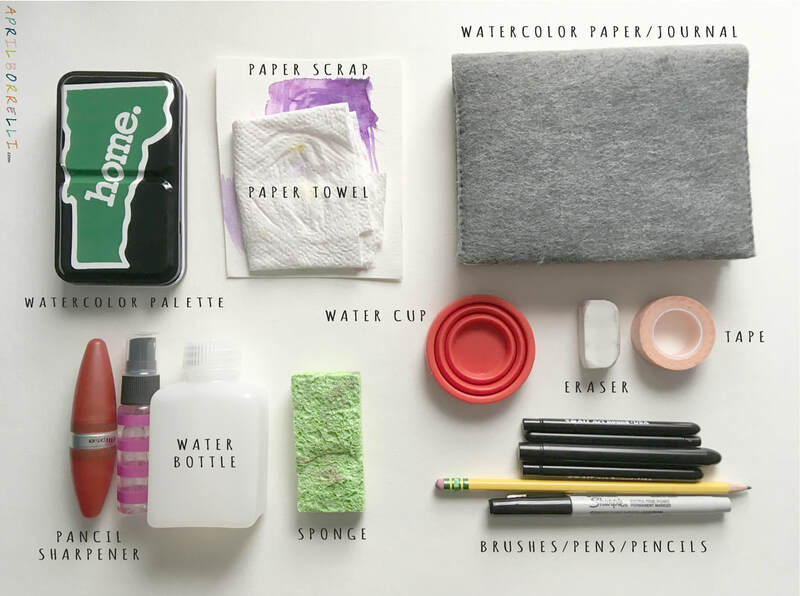 So I have actually found making myself art travel kits a nice little challenge. Below are a few of the items that I think are a must have and a little extra. When I want to bring a lesser amount of junk with me, I often omit the spray bottle, tape and sponge. I also don't always use the water bottle if I know I'll have a water supply. Honbay Watercolor Palette (modified) I jammed some extra wells down the center to add more colors. I like to keep a piece of scrap paper and paper towel. The scrap paper for testing colors, the paper towel for drying my brushes, etc. Any water color paper journal of your choice. This is a small one I made, it has a felt cover for a little traction on my lap. Inside are stitched together pages. I used Bee Paper Company water color paper. The journal is roughly 4.5" x 6". Pencil sharpener of your choice. This one is a cool shape. Spray bottle. This is from one of those air travel kits for your cosmetics. Nalgene Wide Mouth Water Bottle These come in a bunch of different sizes and don't seem to leak. Piece of sponge, just your regular sponge cut into the size you want, from the grocery store. Sea to Summit X-Shot Basically a collapsible shot glass, works great as a little water cup. Eraser, I prefer these white erasers, I have no clue what this one is. It was a large eraser I got at the art store and chopped it into smaller pieces. Washi tape works great as a tape option for framing out your water color. I find that it stays put and still peels off of the paper easily without tearing anything. Plus it's a nice small size to toss into your travel kit. AIT Synthetic Sable Brushes These are decent travel brushes, they are made in the USA and the price was right. A pencil and pen. Nothing fancy just your typical Ticonderoga pencil. It gets the job done, and a sharpie/art marker or pen of choice. Usually have one or two sizes of Micron pens on me. To carry all of this I have a great case by ColorIt (not pictured). It provides generous space without being overwhelming to toss in your tote or back pack and has a hard shell so things don't get crushed. Here's a little close up of my palette. I used Windsor Newton Cotman water colors. I started with the set of 12 colors and added the additional colors. I also have some really large palettes of 24 (QOR Watercolor) colors and 36 (Mijello Mission) colors, that I also love, but this set tends to be my favorite. I should add that I tend to do more illustration rather than typical classic watercoloring. 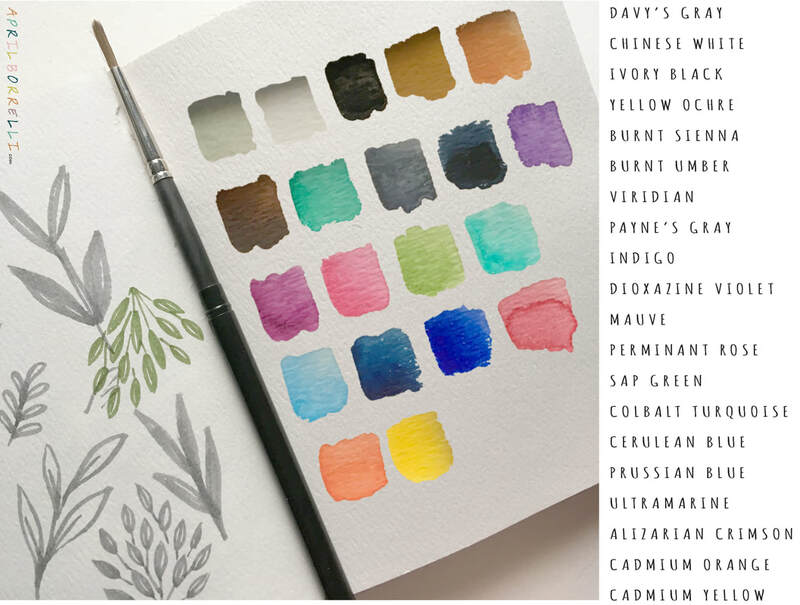 I say this because I know there are watercolor enthusiasts who would insist on not using black or white and mixing to cut down in the number of colors in the palette. But I do what I want how I like it. There is no right or wrong way. Just do what makes you happy. Images copyright April Borrelli 2019. I thought I would make a knitting post as my first "real" post on my new site. If I'm not reading, or drawing, or walking the dog. I'm knitting, so I thought I would share one of my recent favorite patterns found on Ravelry. This pattern can be found via the following link. Best of all this pattern is FREE! 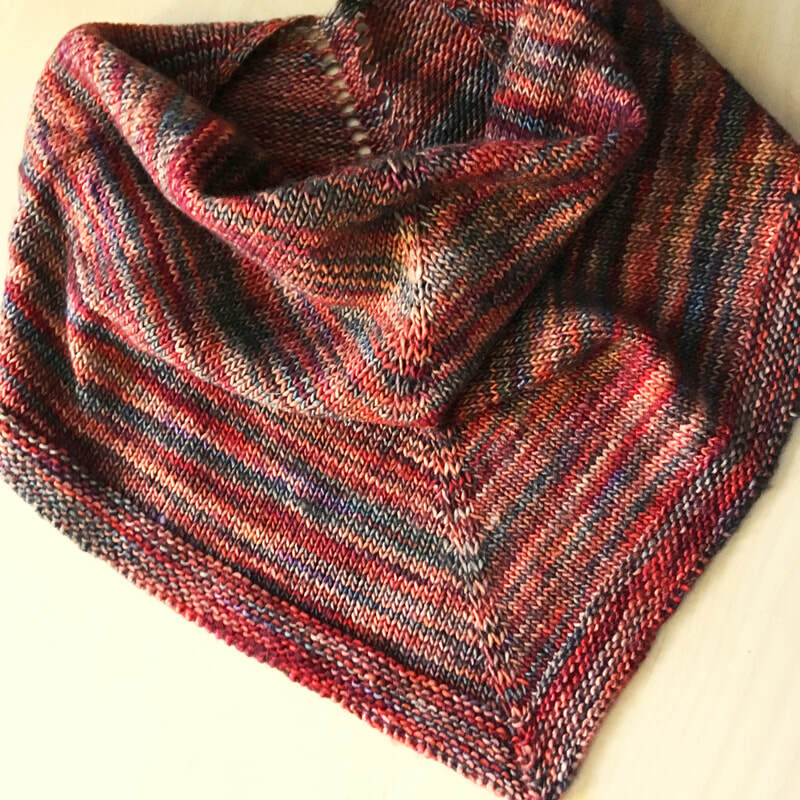 This is a simple and quick knit. I made these as Christmas gifts, which were a big hit. Best part about this pattern is that you can adjust it easily or knit in a different weight or needle size. All you really need to do is make sure the neck opening measures to the specified measurement. 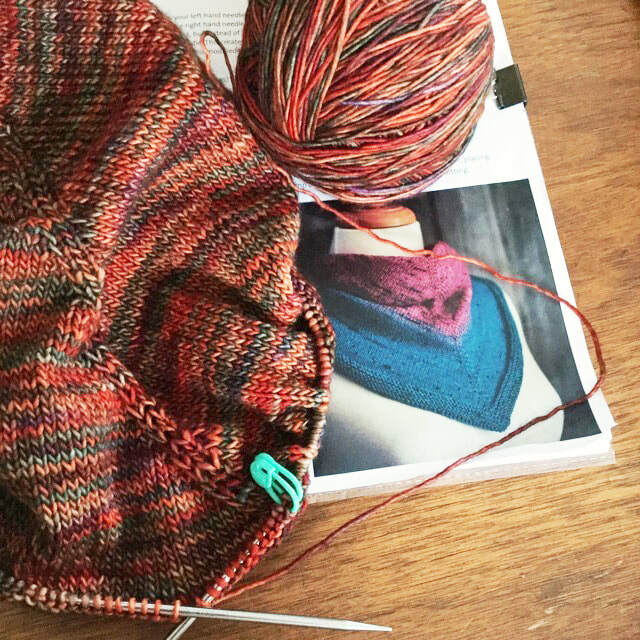 I always look for adjust-ability in a pattern because I tend to look for patterns to knit with yarn in my stash rather than buying yarn specifically for a project. You can also knit it longer or shorter, depending on what you want to achieve. I have knitted the pattern much longer than it calls for, which I preferred. You can also knit it shorter if you want to achieve a smaller bandana look. I've tried this using sock weight, and DK. I'm thinking I want to make another in a nice worsted. Above: First cowl finished. Yarn used Malabrigo Mechita 121 Marte. 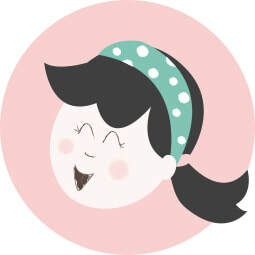 Slowly working on a new site with an updated gallery and a better blog! My hope is to make it more cohesive and post more often. As you can see, there is not much here right now. Hoping to share some art, crafts, and knitting projects with everyone soon-ish. My name is April Borrelli. I am a crafter, knitter, photographer, illustrator. This blog is a collection of my arts, crafts, hobbies and probably a pet picture every now and again. I hope my posts bring a little bit of happiness to your day. For more about me visit my ABOUT page. re-post or alter artwork and images without written permission. Artwork is an intellectual property and is protected by the copyright law.